When we lived in Tachikawa (a suburb of Tokyo, but then, half of Japan seems to be a suburb of Tokyo), I had one ritual. Everyday, I would climb the fire escape at my office building and look at Mt. Fuji, or Fuji-san as it is known in Japan. Usually I was joined by my friend Mark Honma. Sometimes I was joined by others. 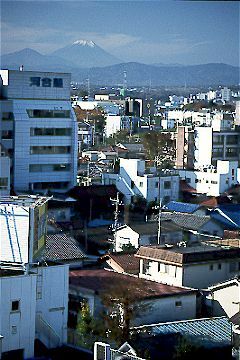 Most days, we could not see Fuji-san, due to clouds or haze, or pollution. But every time we could see it, it made up for the other days. Fuji-san is one of those mountains that has a distinct presence, a personality that everyone is aware of. You can live in Tokyo for a year and not see it, but after you see it once, you will always be aware of it. When we were lucky, we could watch the sun set directly behind Fuji-san, leaving us with a dramatic silhouette. Mt. Fuji is so big and so dominant, that there are literally hundreds of unique vantage points from which to enjoy it. Hakone, for example, is a famous hot spring town near Mt. Fuji, with a lot of attractions. 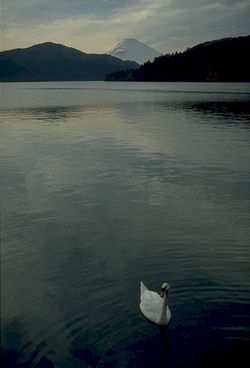 The nearby lakes and mountains provide many ideal locations for viewing Fuji-san. In addition to the land views, there are also excellent views of Mt. 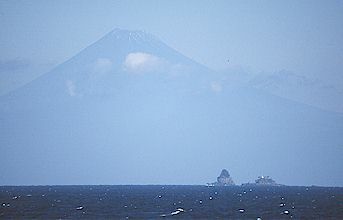 Fuji from the ocean and from the coast of the Izu Peninsula. Of course, the pull to climb Mt. Fuji is strong. So we did. Climbing this mountain is not a nature experience. A Tokyo sidewalk would have been less crowded, and there is nothing but volcanic rock to be seen. The terrain has been likened to a walk through an ashtray. The only real reason to do the hike is to have done it. The Japanese love their symbols, and Mt. Fuji is the grand-daddy of Japanese symbols. 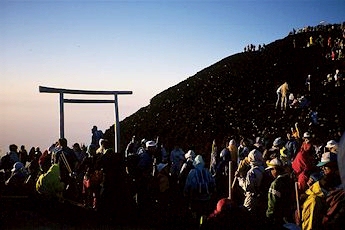 In fact, the ultimate goal is to stand on top of one Japanese symbol, Mt. Fuji, and view another Japanese symbol, the Rising Sun. So you stumble up the mountain in the dark of night, arrive about 30 minutes before sunrise, watch the sun come up, ooh and ahh a bit, take a picture or two, buy a souvenir, and then head back down to the warmth of home satisfied that you'll never have to do that again. As the Japanese say: Only a fool doesn't climb Fuji-san, but only a fool climbs it twice.